In the British army of the 18th century seniority was the path for promotion. In times of peace it could take a career to work up from the junior rank of ensign to the rank of Major, the second in command of the regiment. It was certainly a good idea to get along with the colonel and your fellow officers or life could be difficult, however, competence was not measured in gaining promotion. Ideally, an infantry regiment would have about 500 soldiers and 30 officers when at full complement. The regiment would consist of ten companies. There would be one Grenadier company which would be the most prestigious and senior of the ten companies. Some regiments would also have a Light Infantry company trained to be skirmishers and a flanking unit, but Light Infantry companies were a new innovation in the army and not respected by the army traditionalists. The 35th Regiment of Foot had a Light Infantry company. The 35th Regiment’s Light Infantry Company was led by Captain Edward Drewe, a close boyhood friend of Simcoe. In this company Simcoe was mentored and trained. However, as the junior Ensign in the Regiment, he would have to wait his turn among the other ensigns to be promoted to Lieutenant. Then as a Lieutenant, wait to be promoted to Captain and then to be Captain of the Grenadiers. The last practical step in this hierarchy was Major. The Lt. Colonel commanded the regiment and his appointment was subject to approval by the King. Outside this hierarchy there would be about five staff officers, the Adjutant, Quarter Master, Surgeon(s) and Chaplain. So, how did Simcoe rise from an Ensign in a Light Company in 1770, to a Lt. Colonel in 1779? War certainly helped, but so did luck and being in the right place with the right experience at the right time. In 1772, Simcoe was appointed Adjutant of the 35th Regiment of Foot and in 1774 to Lieutenant. As Adjutant, Simcoe was responsible for much of the administrative affairs of the Regiment and in May 1775 when the 35th Regiment was ordered to Boston, he was among the last of the Regiment to sail from England. When the 35th arrived in Boston, they were formed into a unit with other available regiments to attack the American rebel fortifications on Bunker Hill. The initial intention in sending the 35th Regiment to Boston was to support the local officials in enforcing the British Government’s taxation policies. However, by the time the 35th Regiment arrived, local civil disobedience had degenerated into open rebellion. The British army was virtually besieged in the city. Bunker Hill was one of the Rebel positions which overlooked Boston and threatened the city. On June 17, 1775, the British made a frontal attack on the American positions. These were well-fortified and provide the American militia with good protection as they fired on the advancing British. The British army won the battle, but at an unsustainable cost. More British officers were killed or wounded in that battle than would become casualties during the balance of the war for American Independence. Simcoe arrived in Boston just as the fires from the battle were dying and saw many of his friends and colleagues in the Regiment killed or seriously wounded. He was deeply affected by their courage, but the seniority hierarchy for the British army in America just became much shorter! General Thomas Gage, the Commander in Chief of British forces in North America, believed that the rebellious elements of the population would be cowered by the presence of British soldiers. The Battle of Bunker Hill and the engagements at Lexington and Concord showed that he was wrong. Further, these battles demonstrated that the terrain in New England was unsuitable for regular British army operations. With the British army still in its smaller peacetime status and thousands of miles from its supplies and reinforcements, it could not sustain the losses that would be incurred if they attempted to fight the Rebels around Boston using European methods. A change of tactics was needed and General William Howe was chosen to replace Gage and implement the changes. He abandoned Boston in March 1776, and the British troops withdrew to Halifax. During the French and Indian War, William Howe’s older brother General George Howe became a good friend of Robert Rogers and studied the wilderness war tactics of the Roger’s Rangers. What George Howe learned about fighting in difficult terrain was picked up by his brother William and was used as he led the assault on the steep forested cliff of L'Anse-au-Foulon to secure the British army on the Plains of Abraham and make capturing Quebec City possible. William Howe understood that the European tactics of close order massed infantry formations would not work in America. In America, where the terrain was dominated by trees, rocks, fences, and gullies. Soldiers had to break formation to move around these obstacles. However, they still had to remain organized to provide mutual support and to overwhelm their enemy. In these situations, soldiers had to take advantage of the terrain, coordinate flexibly and work as small groups outside their officer’s immediate direction. In 1774, before he was sent to America, Howe had an opportunity to entertain King George III at the Salisbury Light Infantry camp. Here Howe conducted a field demonstration using Light Infantry as a separate highly mobile brigade organized into files that they could quickly manoeuvre over rough ground, but still form up to hit the enemy forces where they were vulnerable. In 1776, as Commander in Chief of British forces in North America, Howe put his theories into practise. In Halifax Howe set to work to reorganize and train the British troops. The Light Infantry and Grenadier Companies were detached from their regiments to form separate brigades. To manage each brigade, officers with Light Infantry experience were needed. Especially for the Grenadier companies who had to be trained to fight with and use the same tactics as the Light Infantry companies. For Simcoe, opportunity was knocking. It took him four years to be promoted from Ensign to Lieutenant in 1774. In 1776 he was promoted by Howe to Captain of the Grenadier Company of the 40th Regiment of Foot. A meteoric rise in rank. When the British returned to fight the Rebels at New York, Howe’s tactics repeatedly brought great victories, from the Battle of Long Island to the Battle of Brandywine. However, these victories did not bring success, without cavalry to attack the Americans as they retreated or the will to risk his army, Howe could not crush the Rebel army and extinguish the rebellion. Strategically damaging to the British cause was their need to spread out in order to control territory and provide housing and supplies over winter. In this situation they were vulnerable to devastating Rebel raids on specific outposts such as those at the Battles of Trenton, Princeton and Germantown. These forced the British to abandon control over much of the countryside and concentrate their positions around the key centres of New York and Philadelphia. The American militias worked in this vacuum in the countryside to suppressed British sympathizers, drive out British loyalists and cut off supplies to the British army. The only units that could challenge the Rebel militia dominance of the countryside were the rangers manned by America Loyalists. These units could protect farmers as they came to sell provisions to the British and provide cover for British foraging parties working in the countryside. They were also excellent scouts who knew the countryside and could blend in to work behind enemy lines. When the British army was on the move, they formed the advance and rear guards for the British Infantry columns. The Queen’s Rangers were one of these units formed in 1777 by Robert Rogers of the French and Indian War fame. The Rangers trained as light infantry and fought bravely at the Battle of Brandywine under Captain James Wemyes also of the 40th Foot. Simcoe saw the promise of the Queen’s Rangers in the American theatre of war. It offered the opportunity to develop the skills and experience of commanding a large independent unit which only a general would normally experience. When Wemyes was wounded at the Battle of Germantown, Simcoe, though still recovering himself from wounds he incurred at Brandywine, jumped at the opportunity to become its commander and was promoted to the Provincial Rank of Major commanding the Rangers. The designation of Provincial Rank meant that Simcoe could act as a Major while in active service in America, but in the British army establishment he still held the rank of Captain of the 40th Foot. We will go over the story of Simcoe’s management of the Queen’s Rangers in another blog. It can be best summed up by the American General “Light Horse Harry” Lee who in his memoirs describes the Queen’s Rangers raid on Middlebrook New Jersey: “This enterprise was considered, by both armies, among the handsomest exploits of the war.” By May 1779, in recognition of the Rangers’ successes, they were brought into the British army establishment as the 1st American Regiment. Simcoe became its Lieutenant Colonel with regular army status. Defeat is never good for a career and the end of the American Revolution brought hard times to the officers and men of the Queen’ Rangers. Although very ill and still recovering from several wounds, Simcoe’s good fortune held. On returning to England he successfully wooed the wealthy heiress Elizabeth Gwillim and settled down to develop an estate and become a country gentleman. However, Simcoe’s loyalty to his men and concern for their fate, as well as the cause he fought for during the Revolution kept him engaged in the affairs of North America. 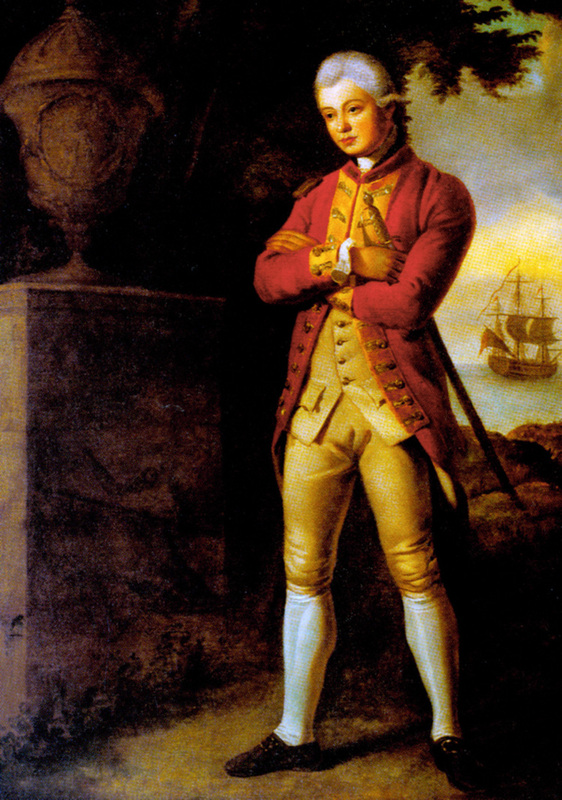 With his reputation, gentleman status and Elizabeth’s wealth, Simcoe decided to get involved in politics and became a Member of Parliament in William Pitt’s faction. Under William Pitt’s government Simcoe helped with the passage of the Canada Act of 1791 and was appointed the first Lieutenant Governor of Upper Canada. Here he worked over the next five years to found a prosperous home for the Loyalist refugees from the United States and an alternative in North America to what he saw as the flawed system of government as it existed at the time in the United States. As the French Revolution evolved into the Napoleonic Wars Simcoe was back in England. When Napoleon threatened to invade England Simcoe was appointed Lieutenant General commanding British defences on South Western England. By 1806 the threat of invasion had passed and Simcoe was offered the jewel of British army commissions, he was appointed Commander in Chief of British Forces in India. Sadly for Simcoe’s place in British Imperial history, what might have been wasn’t to be. John Graves Simcoe died on October 26, 1806 and never reached India.